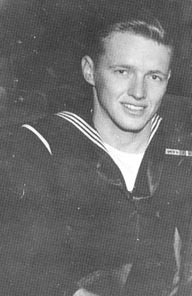 James F. McNally, Seaman l/c, born Dec 2, 1924, Chokio, MN, completed high school and joined the USN in September 1943. He was stationed at Farragut, ID, and aboard the USS West Virginia. Memorable experiences were of the many kamikaze attacks; the sea battle at Lingayen Gulf; bombardment of islands; and sailing into Japan for the peace treaty. Discharged in March 1946 with the rank of Sl/c. Awards include the American Theater, Philippine Liberation, Occupation of Japan Ribbon, Asiatic-Pacific and the Iwo Jima and Okinawa Campaign Ribbons. He has four children and 10 grandchildren. He is a farmer and worked as a postmaster for 30 years.